"This is the recipe my mother uses to frost gingerbread cookies at Christmas." Sift the confectioners' sugar into a small bowl. Stir in enough milk to make a smooth but not too runny consistency. You may need to adjust with some more sugar. Divide this mixture into small containers, depending on how many colors you want. Color each small container with colors appropriate for the season, using as much food coloring as needed to create desired hues. 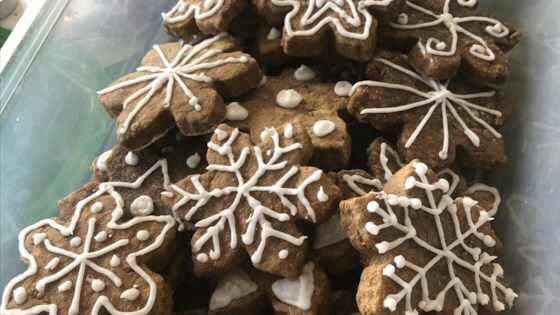 I could not find my recipe for Gingerbread cookies so I made these instead .......I was very disappointed in the outcome. They did not have a good flavor or a food texture. WASTE IF TIME! Thanks Alison for the recipe! After reading the reviews, I only added 1 tbsp of milk at a time and ended between 3 and 4 tbsps. My kids (5 & 3) enjoyed frosting their gingerbread cookies! Way too runny. You need about 5 times as much powdered sugar then it calls for.